As the Queen`s most trusted advisor, it is your task to investigate the murder of a Roman soldier, who had broken into Cleopatra`s palace. Use your Hidden Object skills to follow the clues as they lead you into a world of national politics and personal revenge! 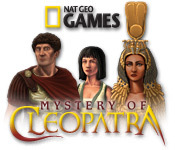 Explore the legendary land of Alexandria as you find objects, piece together evidence, and hunt for the murderer in the Mystery of Celopatra.